The accountancy profession is one of the oldest known to civilization. It forms the basis of commerce and much of mathematics, as well. These days, it's a fundamental part of any commercial or governmental organization. Nonprofits rely on accountants, too. Since a Certified Public Accountant is the very top of the profession, the state has an interest in ensuring that only the very best accountants carry that credential. 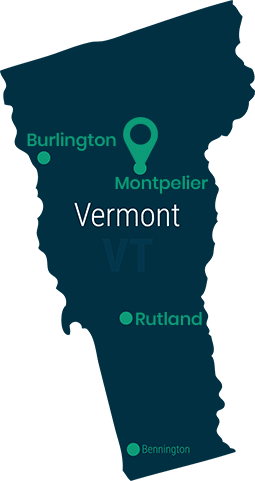 Each state has its own guidelines for becoming a CPA, including Vermont. If you wish to become a CPA in Vermont, keep reading. Education is the backbone of most any profession, and accountancy demands more than most. Vermont requires a minimum of 150 semester hours of college credit. Then you must validate your education by passing all four parts of one of the most difficult professional exams in the nation. If, on the other hand, you are coming to the CPA licensure process from Canada, your college or university must be part of the Association of Universities and Colleges of Canada. If you received your education in some other country, you may still have your credits evaluated. The National Association of State Boards of Accountancy (NASBA) has evaluation services for foreign academic credit. If they verify your transcripts, and you have enough qualifying credits, the Board will likely accept this part of your application. The CPA examination is a four-part test that covers the breadth and depth of accountancy. It is an extremely difficult exam and many accountants base their entire careers around having passed just one portion. In order to take the exam, the Vermont Board requires that you have completed your educational requirements, or be within 60 days of doing so. If you are still in school, provide a Certificate of Enrollment to verify your status. If the board grants you permission to take the exam prior to completing your education, you must submit official transcripts within 120 days of taking the test. If you cannot submit transcripts within this window of time, you will forfeit any examination credit you earned. Once your application is accepted, CPAES will send a Notice to Schedule. From this point, you must be aware that time is of the essence. You should contact your nearest Prometric testing site and schedule the first portion of the CPA examination. You can choose the order in which you take the four parts. Along with your academic learning, potential CPA licensees must also complete a period of experiential learning. The Board requires one full year of experience, 2,080 hours, working in accounting. You must work under a CPA licensed by a state board. During your tenure as an intern or employee in a public accountancy, you should gain practical public accounting experience that includes a variety of skills. As you progress as an employee, make sure that you are accounting for all of your time. When you work on a specific skill set, make sure that you log the hours and note any specific details. This sort of self-reflection may be useful to you as a professional, but it will certainly help you verify your experience to the board. The more explicit your notes, the easier you can make things for your supervisor when she fills out the paperwork at the end of the experience portion of your licensure process. To verify your experience for the Board, you will need to submit the appropriate paperwork. The Board's website includes a Forms and Instructions page that includes the 6-page Report of Supervised Experience form. To ensure expediency, have your supervisor complete and submit this form in your final days of employment, or in the final days of your required tenure. That is, if you are leaving the firm or company, do so with all of your paperwork complete. Licensure in Vermont entails four basic elements: education, experience, ethics, and examination. For each, you should conform to the specific standards set forth by the Vermont Board of Public Accountancy. Use this section as a checklist for you licensure process. You should complete an ethics course that covers the AICPA's Code of Conduct or the Vermont accountancy statutes. You can order a course through the AICPA's website and either take it online or have materials sent to your home. The course is self-study and includes an open-book examination. The CPA exam might be the single hardest hurdle along the way. In fact, many people must retake one or more portions before they satisfactorily clear the obstacle. Nonetheless, with diligence and a solid study group, you can pass all four parts. To maintain your license, you will need to continue your education. Vermont asks that you complete a minimum of 80 CPE hours per each two-year licensure period. To complete this requirement, you should seek out CPE providers that meet the standards of the National Registry of CPE Sponsors. This registry is published and maintained by NASBA, so any provider therein will be appropriate. Note that credit is given in whole-hour increments and each 50-minute period counts as one hour. Thus, if you spend 1.5 hours (90 minutes) in a classroom, you will only receive one CPE hour. However a 100-hour seminar will count as 2 CPE hours. When accounting for your hours, note that you may carry over up to 10 hours to the next licensure period. You should also be sure to make a detailed accounting of your CPE hours. Keep a folder of all of your certificates, and even scan them and save them electronically. The board requires that you maintain these records for a minimum period of five years after completing any given course. For your records, make sure you know when it took place, the course title, who taught it, course duration, and any details about the subject matter. Apart from the NASBA registry itself, you might discover CPE opportunities at colleges, universities, and national or regional conferences. There are also online courses and seminars that you can attend. Note that if you take courses for credit, you must maintain a record of successful completion. If you take college courses on a not-for-credit basis, you must have the instructor sign a statement to verify the hours you spent in the classroom. After you have attained your CPA license, practicing and maintaining your profession will be a pleasure. After all, you are at the top of the business world. Congratulations on a job well done!